With the services of top Tier 1 and Tier 2 fiber optics carriers such as Level 3, tw Telecom (CenturyLink) and XO Communications (a Verizon Company), our existing circuits are 'diverse path' and designed for both transport and IP on Gigabit Ethernet. The Data Center is also On-Net with our preferred provider’s networks which mean great advantages to our Customers when wanting to connect nationally. Our Customers also have options to contract Point to Point and Point to Multipoint circuits directly from carriers. 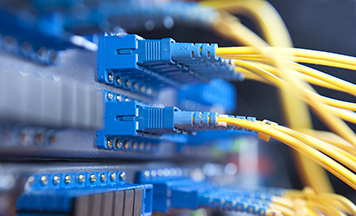 We provide Fiber, Cat5, Cat6 or Coax cross-connects to customer who whish to expand within the data center or contract their circuits. The customers circuits and traffic are closely monitored by our Network Operations Center who at first sign of bandwidth inconsistencies would send immediate notifications to the customer who has real-time access to their internet bandwidth graphs and can request remote hands assistance 7 x 24 x 365.